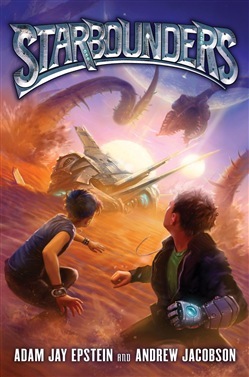 Adam Jay Epstein and Andrew Jacobson, authors of the beloved Familiars series, ramp up the action in this space-age adventure that School Library Journal calls "a satisfying choice," perfect for fans of Star Wars and Percy Jackson. Zachary Night has been waiting his whole life for this moment. Like his family before him, he's finally headed to Indigo 8, a top secret training center where future Starbounders learn the skills to protect the galaxy. But being a Starbounder is no walk on the moon. No sooner has Zachary mastered the warp glove basics than a mission into space goes wrong and puts him and his new friends right in the line of fire. And when a plot to destroy Indigo 8 comes to light, Zachary will have to get back to Earth on his own and fast—before there's no Earth left to go back to. With the "winning combination of action and humor" (SLJ, starred review) that earned The Familiars an Indie Next List Pick and eight state award nominations, Starbounders is an out-of-this-world adventure that has surefire kid appeal. Acquista Starbounders in Epub: dopo aver letto l’ebook Starbounders di Andrew Jacobson, Adam Jay Epstein ti invitiamo a lasciarci una Recensione qui sotto: sarà utile agli utenti che non abbiano ancora letto questo libro e che vogliano avere delle opinioni altrui. L’opinione su di un libro è molto soggettiva e per questo leggere eventuali recensioni negative non ci dovrà frenare dall’acquisto, anzi dovrà spingerci ad acquistare il libro in fretta per poter dire la nostra ed eventualmente smentire quanto commentato da altri, contribuendo ad arricchire più possibile i commenti e dare sempre più spunti di confronto al pubblico online.